Jalesh Cruises first premiere cruise line catering to the Indian domestic and international cruise business, received its first ship, Karnika, the erstwhile Pacific Jewel from P&O Australia, in Singapore recently. 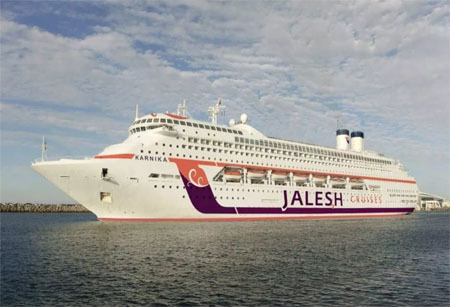 The vessel, which is the first in the fleet of the multi-destination cruise line Jalesh Cruises, will reach Mumbai on April 17. Keeping with tradition, the 2,000 passenger ship, which weighs 70,285 tons, will go through its naming ceremony at a gala event in Mumbai on April 19. Mr. Jurgen Bailom, President & CEO, Zen Cruises, said, “Today marks an important day for the Indian cruise tourism industry with the acceptance of Jalesh Cruises first ship. We are going to offer a memorable vacation to passengers on board with exotic culinary experiences, international hospitality and best of entertainment shows at high seas. With Karnika, we mark the beginning of memorable cruise holidays that will bring joy and delight to the Indian and global community.